The aim of this chapter is to examine the stages of business process re-Engineering (BPR) and the critical success factors needed to successfully implement e-Government initiatives in a major tourist town in Spain. The research utilises a case study as the main methodology for understanding the penetration of e-Government in a tourist town in Spain. This town is one of the most attractive destinations for holiday travelers from Northern and Central Europe, as well as for many Spanish people. The chapter shows how the stages of BPR are deployed in a local e-Government project and how the critical success factors (CSFs) have been addressed. These results may serve as an exemplary approach to understanding BPR and critical success factors in local e-Government strategies. The study provides lessons for policy makers and other stakeholders, including project managers and implementers that will help them to increase the efficiency and efficacy of their e-Government adoption processes especially if their economy is tourism-centered. Accordingly, the local government in many tourism-oriented, emerging economies may benefit from this experience, since it will allow them to identify the relevant success factors and to overcome possible barriers culminating into the increase of efficiency of their e-Government development plans. Most public institutions the world over facilitate and shape the development of infrastructure and services and experiment with new ways to deliver information and services via electronic channels (Govindarajan & Gupta, 2001; Li, 2003; Phan, 2003). E-Government practices must be regarded as tools for creating added value for public products and services, thus increasing the administration’s efficacy, efficiency, transparency and security. Consequently, a well deployed e-Government strategy is a fundamental element of the public sector’s modernization process, because it provides a wide variety of information and a form of interaction between public sector organizations, businesses and citizens, while improving the performance of government organizations and promoting the welfare of citizens (Ebrahim & Irani, 2005). However, despite the plethora of literature on e-Government, the rate of success in this area is dismal, especially in the developing countries (Nasim & Sushil, 2010). Although most Western governments already offer centralized e-Government services, those in the developing world do not. It has been estimated that between 10 and 40 percent of citizens in the developing countries have access to such services, and that this poor record can be explained by (lack of) service availability (TNS, 2003). In these countries, even though there is a growing need for local governments to provide efficient services, due in part to a general concern about public spending, e-Government strategies have been deployed only in an ad hoc fashion and only by individual public bodies. A way to help public organizations in transition economies to improve their performance is by seeking to update their current management practices and improve the efficiency of their technological investment. One way of achieving these goals is to employ external professional and impartial advice (Smallbone et al. 2010). Thus, a developing country may learn from a developed country, but it will be important to know whether the governmental bodies in the developed country (e.g., Spain) can use their successful experience of implementing e-Government strategies to support delivery of public services, where this may serve as a learning experience that can help e-Government adoption in the developing country. However, although there has been research into e–government since the early 1990s, very little research has compared practice in countries where the political, social, cultural and economic environments differ greatly (Deakins et al, 2010). In addition, the majority of e-Government studies have focused on central government strategies (Wauters, 2006), even though the local level is often the main point of contact for the delivery of public policy. 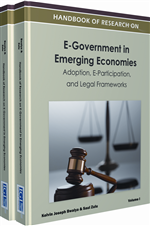 The purpose of this chapter is to outline a number of contrasting lessons that will help to increase the efficiency and efficacy of e-Government adoption processes in developing economies, especially if their economies are tourism-centered. As aforementioned, the methodology used is a case study. The chapter presents the case of a major tourist town in Spain, which is one of the most sought-for destinations for holiday makers from Northern and Central Europe, as well as for many Spanish people. In fact, there are a large number of people who have adopted this city and its surroundings as their second residence, especially senior citizens fleeing from colder countries. The value of this chapter lies in the contribution to the management of e-Government projects, identifying the stages of a BPR strategy to overcome the most pressing barriers to e-Government adoption, and how certain critical success factors are key to the determination of areas for improvement and making the most of investments of time and money. Critical Success Factor: An element that is necessary for an organization or project to achieve its mission. It is a critical factor or activity required for ensuring the success of a company or an organization. TQM: A holistic management philosophy that focuses on the maintenance and continuous improvement of all the functions within an organisation, with the goal of meeting or exceeding the requirements of customers and other stakeholders. Case Study: A research methodology common in social science. It is based on an in-depth investigation of a single individual, group, or event. Case studies may be descriptive or explanatory. E-Government: It refers to the utilization of the Internet, the world-wide-web and other web-based telecommunication technologies for delivering government information and services to the citizens. New Public Management: It signifies the adoption of major principles of business administration in the domain of public sector, aiming at efficiency, effectiveness and economy in performance of public sector. Change Management: The systematic approach and application of knowledge, tools and resources to deal with change. Change management means defining and adopting corporate strategies, structures, procedures and technologies to deal with changes in external conditions and the business environment. Business Process Re-Engineering: The fundamental rethinking and radical redesign of business processes to achieve dramatic improvements in critical contemporary measures of performance, such as cost, quality, service, and speed.